The prospective Posh away kits for 2018-19. 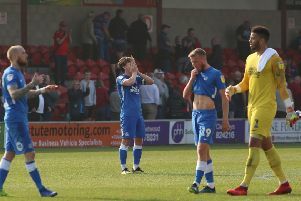 Peterborough United are giving their fans the chance to choose the away kit for the 2018-19 season. There are three choices, an all red kit, an all white kit with a gold trim and a black and lime green kit. Vote for one of these three Posh shirts. Peterborough PE2 8AL’ or in person at the ABAX Stadium club shop. Fans have until 5pm on Friday, March 2, 2018 to cast their vote.